Infrared therapy uses the wavelengths of the visible and non-visible light spectrum that heat the body normally. This radiant energy is absorbed by the body and stimulates a series of metabolic events at the cellular level activating the sweat glands and increasing blood and lymphatic flow. This process can stimulate healing and relieve pain, amongst other benefits. Unlike traditional saunas which use conduction to heat the air around you, infrared saunas use far infrared energy which is able to penetrate about 3.5 - 4 cms into the body, gently warming it from the inside as well as the outside. This makes infrared saunas effective at a cooler temperature which is much more comfortable to tolerate than traditional saunas. Infrared therapy is completely safe and has been used effectively for millennia to treat or ease certain maladies and is rapidly gaining popularity as an effective natural therapy. There are many ways infrared therapy can benefit the body, and all without the need to exercise! We are living in a world where modern advances in technology and medicine have exposed us to concentrations of chemicals far above what our ancestors were exposed to. There is a wealth of scientific evidence proving the toxic bioaccumulation of thousands of chemicals, drugs, pollutants and preservatives within the body, predominantly in fatty tissue. There is also evidence showing the harmful effects of exposure to these chemicals, either directly or through bioaccumulation, on almost every organ in the body including associations with cancers, immune system dysfunction, fertility impairment, weight gain, digestive issues and psychological damage. The heat produced by the body activates sweat glands which is one of the body?s main mechanisms for detoxification. Through sweating, heavy metals, toxins and other substances are released from the fat cells in which they are stored. The deep heat of the sauna helps to dilate blood vessels and bring relief and healing to muscle and soft tissue injuries. It also promotes muscle relaxation. Infrared saunas have been shown to be helpful in the relief of symptoms of arthritis, fibromyalgia, back and neck pain and for sports recovery. The body?s natural mechanisms for fighting bacteria, microbes and infection is to raise basal body temperature. Infrared therapy acts in the same way and activates the immune system. It has been shown that cold and flu-like symptoms are quickly relieved when sufferers are exposed to early infrared therapy and studies have also shown that regular use of infrared saunas can reduce the incidence of cold and influenza by up to 65%. Infrared energy increases metabolic rate, burns calories and aids in fat loss. A recent study has shown that people using infrared saunas 3 times weekly can eliminate 4% body fat over a 4 month period. Through sweating, water weight is also reduced. Studies from The Mayo Clinic found that infrared sauna therapy significantly improved blood vessel functioning in patients with high-cholesterol, diabetes and in smokers. A recent study has suggested that men who engage in frequent sauna use have reduced risks of fatal cardiovascular events and all-cause mortality. Infrared therapy has been shown to improve the appearance of acne, scars and burns and also skin elasticity. In addition, wounds heal more quickly leading to reduced scarring. The deeper penetration of infrared light in our sauna compared to traditional saunas has also been shown to be more effective at reducing the appearance of cellulite. We have chosen the Clearlight Infrared Sauna as one of the more superior products on the market. 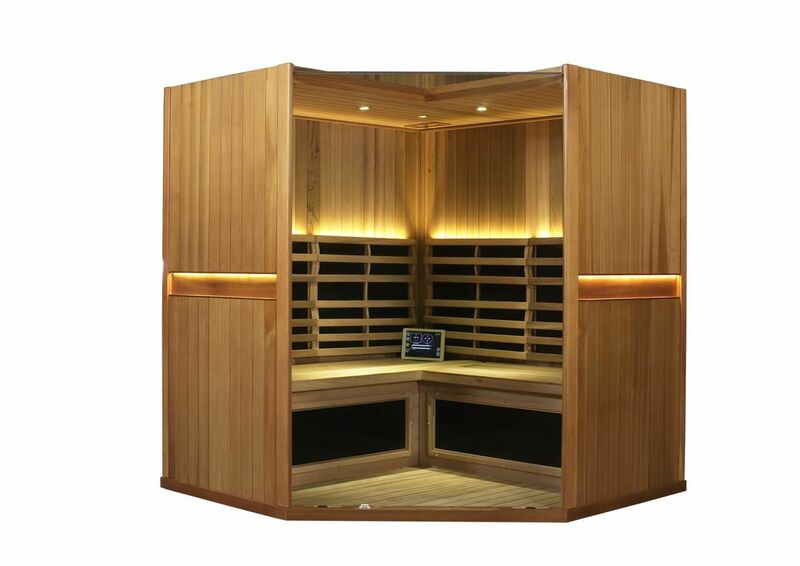 Our sauna uses the only infrared heaters on the market that combine both the very high infrared output of ceramic with the long wave infrared heat of carbon to emit high quality infrared heat that is matched to the human body?s absorption of heat. These heaters are the only carbon-based heaters that produce virtually no EMF (electromagnetic fields), which have been shown to be harmful, and the beautiful and classic design has been crafted from completely non-toxic materials, and is made from Eco Certified Grade A Western Red Canadian Cedar. The heaters within our sauna surround your body and target your core to heat your body from every direction and emit the full spectrum of infrared wavelengths 100% of the time to optimize your sauna session. Please bring a large towel for you to sit on while in the sauna. Alternatively you can hire a towel from us for $5. We also have cold drinks available to purchase. Is the sauna safe for everyone? What can I expect from my session? When you arrive you will be shown to your private sauna room. Your session time is 45 minutes. We recommend hydrating well prior to the session and to drink at least 250mls water afterwards - we have cold drinks available to purchase. You will sweat. A lot! Your body will become more accustomed to the experience the more you use the sauna but if you experience any symptoms of nausea, dizziness or significant fatigue we recommend discontinuing your session immediately. If these symptoms persist, please contact your doctor. We recommend keeping the sauna temperature between 40 - 55 degrees for the best results. You can monitor this with the temperature gauge located on the control panel and adjust the temperature inside the sauna by opening the sauna door should it get hotter than 55 degrees. Once your session ended there is a cold damp towel located in our bar fridge for you to use to cool down. You should leave feeling refreshed and very relaxed. Please be aware a shower is not included. How many people can use the sauna at one time? We have a 4 person sauna but for maximum comfort we only allow maximum of 2 people per session. The price of the sauna session will remain $25 regardless of the number of people in the sauna.